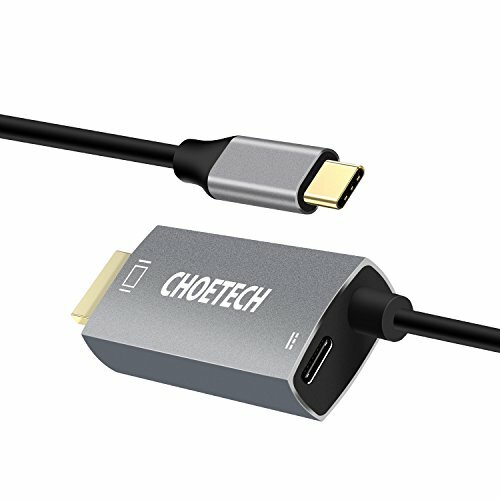 CHOETECH USB Type C to HDMI Cable with USB-C PD Charging Port can expand your computer's connectivity and functionality with the PD interface for ultimate flexibility. Support PD and charge the latest USB-C computer or smartphone up to 60 watts. CHOETECH recommends pairing devices with the stock Power Adapter recharging your devices. Smartphones charging rate is depending on the supplied charger. Computers requiring above 60W will charge at a 60W maximum. The HDMI connector is gold-plated to provide rigidity, and improve the signal performance. Support HDMI 2.0 and former version. - Apple2017/ 2016/2015 MacBook 12"